Whey Protein and Protinex All You Need to Know about Protein! 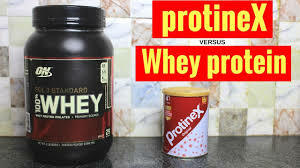 Hey everyone In this blog healthytipsforu.com I am going to share with you about the whey protein vs Protinex Which one is best for you to read the blog completely. Protein is the most important nutrients for the malfunctioning of our body. A 60 Years of adult who does not do any exercise still need an amount of 50gm to 60gm of protein on a daily basis however if the goal is to increase the muscle the protein diet is to be increased but If the person is fully vegetarian or has a very busy schedule then it becomes more difficult for him to manage protein hence the need for protein supplement arises in which protinex and whey protein are the popular ones. Let's compare them both on there price nutrients and daily needs. We will also discuss whether these protein powder are safe or not? When and how they should be consumed and the amount you should take for a basic need. Whey protein is a type which is extracted from dairy milk. When we separate paneer from milk by adding lemon into it the greenish product which is left behind as a liquid is nothing but protein and mixture of other nutrients. It is this mixture which is further process to get whey protein. It is extracted from a vegetarian source and can be taken by men and women both. A 30gm of a scoop of whey will give you 1 gm of calory 1 gm of fat 3gm of carbohydrates and 25gm of high-quality protein. Also as it contains other nutrients in a very small quantity it is a linear source of protein which is for u as it aids in faster muscle building. On the other hand, Talking about Protinex a 30gm of scoop will give you 105 calories, 9.6gm of protein, 16.4gm of carbohydrate, 9.3gm of sugar, a negligible amount of fat and lot of vitamins and minerals. Protinex, as we can say not a lean source of protein moreover for every 9gm of protein you take you will be getting the same 9gm of sugar as free whereas, a serving of protinex will look like as half protein and half sugar now it's up to you which one would you like to choose but why people choose protinex over whey protein. The major reason can be a lack of awareness or pricing of the whey. The 250gm of protinex cause Rs.375 whereas this 900gm of whey will cost you around Rs. 3000. So mathematically we can say that this whey protein is 2 times costlier than protinex. 1gm of whey protein will cost you around Rs. 4.1 and 1gm of protinex will cost you around Rs 4.5. Yes, are you shocked by the results I was too. You have to put more money in the long run but it is cheaper and efficient for you and more importantly, you will be getting high-quality protein which is better for you. Why we are calling whey a high-quality protein because it is extracted from milk and even if you look at its ingredients very first mention ingredient is whey protein from milk. Consuming 1 scoop of this protein daily is fine for you. I think you got the major differences between these two. You can have 1 scoop of protein before post workout it will help you to build muscles very well. Thanks for reading the post kindly share it with friends and let them know about it too.